Laksa. A coconutty, curryish, creamy, spicy soup filled with silken rice noodles and topped with damn delicious chicken, herbs and more spiciness. Now, I have trouble telling you where the dish originates from – on the one hand I think it’s Malaysian, on the other, Singaporean. And i’m pretty sure I saw it around it Thailand too. Confusing. So I did a little research and learnt a new word: Peranakan. Reading that Laksa is popular in Peranakan cuisine, lead me to discover that Peranakan Chinese are descendants of Chinese immigrants who came to the Malay Archipelago (Singapore, East Malaysia, Indonesia included), otherwise known as maritime Southeast Asia. Explains a lot. There’s our geography lesson for the day. I have also learned that there are various types of laksa, so for those of you who are laksa specialists, I will confirm that this is a recipe for a curry laksa. Spicy curry paste with creamy coconut milk, stock and other delightful additions come together for a taste explosion. My recipe deviates from the traditional in some elements and remains loyal in others. For one, I don’t like tofu. I’m sorry. So I didn’t spend time trawling asian supermarkets looking for the fried tofu puffs that regularly adorn laksa soup bowls, and instead spent time thinking about the other yummy adornment alternatives. Like a home made chilli concoction. 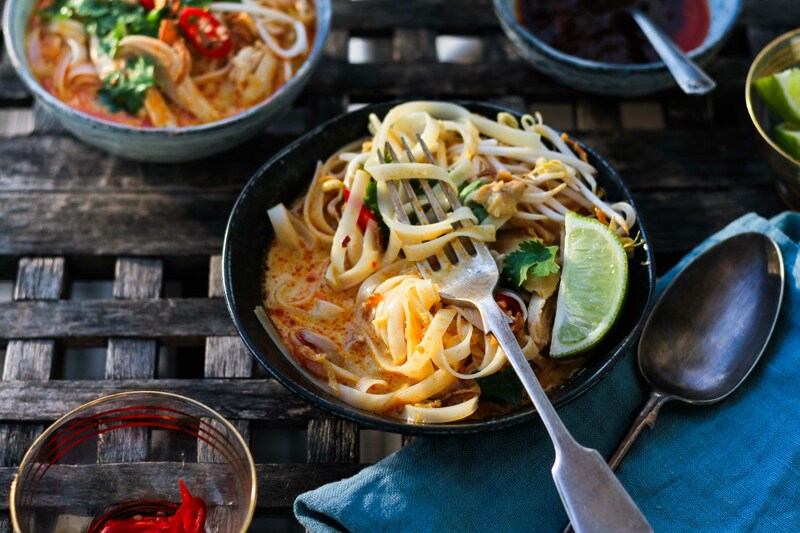 Another – I have combined a store bought laksa paste with your own additions to create an easily attainable and blooming fantastic version that is not going to consume your entire week with preparation. Ok fine it doesn’t take long at all I was just being lazy. But this is a pretty darn amazing lazy recipe. 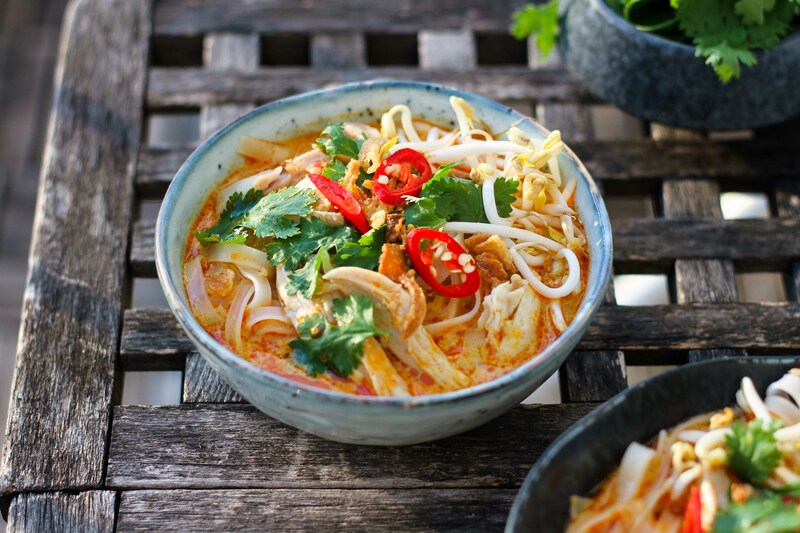 I’ve noticed that some places, and some recipes, serve their laksa with chilli sauce on the side that you can dollop in willy nilly; I think this is a wonderful idea so have included one in my recipe. 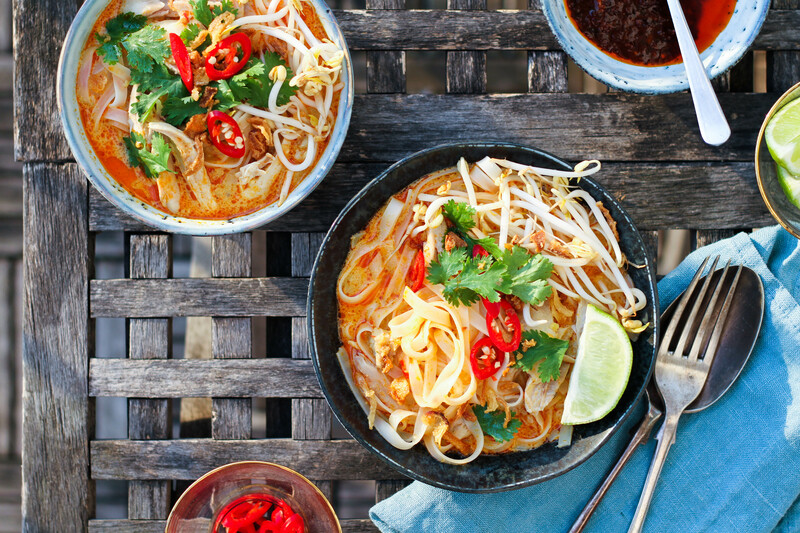 Your laksa should be a balance of spicy, sweet, creamy and sour and salty; it’s fun to have fish sauce, lime wedges and chilli sauce on the table so people can adjust the flavour in their bowl of wonderment as they like. CHICKEN NOTES: So there are a few ways you can do your chicken here. My favourite is to boil the chicken in the chicken stock. This really adds depth to the chicken stock if you’re using a stock cube, and you get the added flavour from the chicken skin, which is otherwise discarded. Boil your chicken drumsticks in the chicken stock (as per recipe). Season your chicken and rub on a little olive oil, then bake in a 200°C (400°F) oven for 30-40 mins, until the chicken falls off the bone. If you do this, skip point 2 and use 2 cups of chicken stock in your recipe, ignoring the water. Remove the skin and shred the chicken using two forks. Use leftover chicken and shred it. If you do this, skip point 2 and use 2 cups of chicken stock in your recipe, ignoring the water. 1. CHILLI PASTE: Mix all your ingredients together in a small bowl. Should be very spicy. 2. CHICKEN STOCK: Put your chicken stock, water and chicken drumsticks (skin and all) in a medium saucepan and bring to the boil. Reduce the heat and simmer for about 30 minutes until the liquid has reduced to about 2 cups and the chicken is falling off the bone. Take the chicken drumsticks out of the broth and let cool slightly. Remove the skin and tear the chicken meat off the bones in shreds. Chuck away the bones and set the broth and chicken chunks aside. 3. LAKSA: Heat 1 tbsp oil in a large saucepan over a medium heat. Add your minced ginger and garlic and stir fry for a minute, then add the lemongrass and chillies and cook for a further minute. Add the laksa paste and turn up the heat. Keep stirring and cook for another couple of minutes, or until very fragrant. 4. BROTH: Add the coconut milk, your chicken stock (should be between 2 and 2 1/2 cups worth), 1 tsp fish sauce and 2 tsp homemade chilli paste. Whisk it all together until properly mixed and throw the lemongrass stalks in there. Put the lid on and simmer for about 15 minutes. Taste and squeeze in some lime if it needs a tang. Add another tsp fish sauce if it needs some more saltiness. 5. 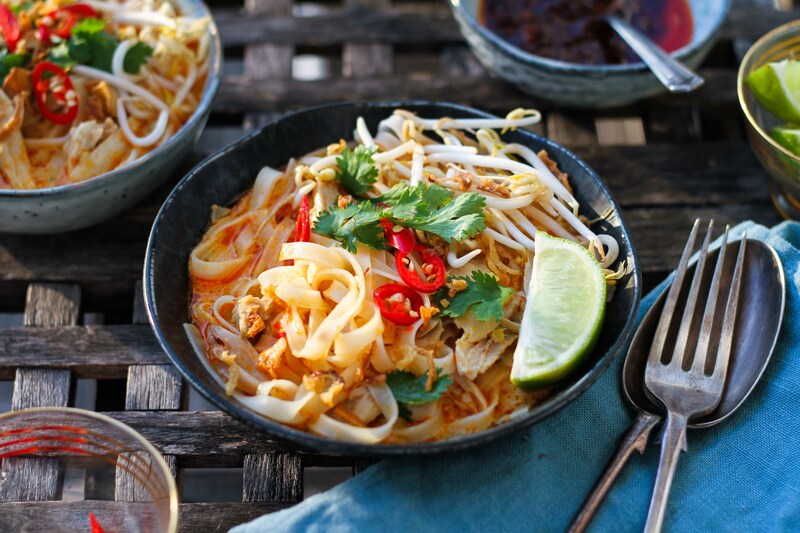 NOODLES: Whilst the laksa is simmering, prepare your noodles. Pour boiling water over your dried rice noodles, stir and leave to stand (off the heat) for 4-5 minutes, until flexible and tender but not too soft as they will continue to cook in the hot soup. Drain the noodles and run under cold water to stop the cooking. Divide them between your two serving bowls and top with the shredded chicken. 6. 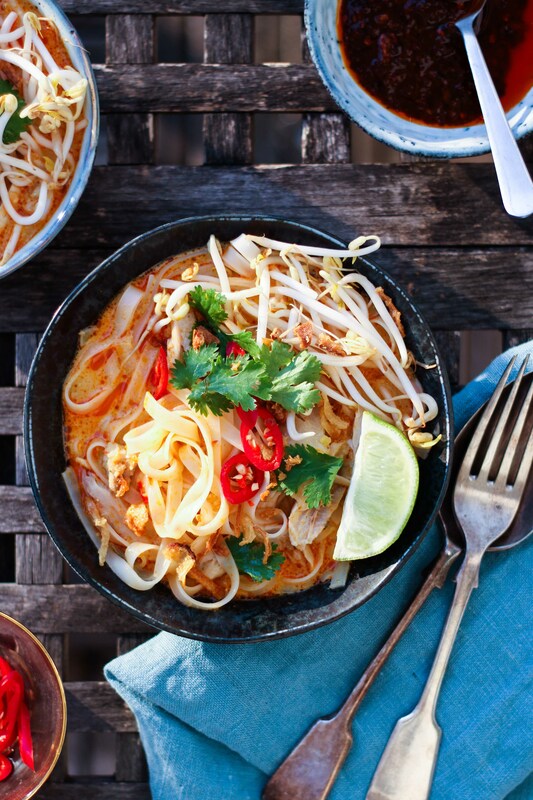 EAT: When your laksa has simmered and is thick and wonderful and delicious (and tasted and adjusted if necessary), ladle it onto the noodles and chicken in the bowl. 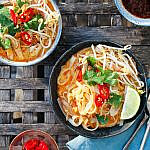 As above, your laksa should be a balance of spicy, sweet, creamy and sour and salty. Top with a handful of beansprouts, coriander leaves, sliced chillies, crispy onions and a lime wedge. So delicious.